Kawakubo Shintaro, the editor of Shingeki no Kyojin creator Hajime Isayama, confirmed on Twitter that production of season 2 of Attack on Titan is on-going. According to Shintaro, the upcoming April issue of Bessatsu Shonen will contain juicy updates on the second season of the much-awaited anime series. No other than Isayama and AOT director Araki Tetsuro will provide an inside look on the development of the anime series, which is expected to debut at some point between late 2016 and early 2017. Updated: Summary of the Interview as translated by Yusenki and edited by Fukushu. Isayama & Araki take a lot of consideration toward Sasha's speech patterns in the 2nd season, because she usually speaks in the standard language. But when she returns to her hometown in season 2, Sasha speaks in dialect. Isayama wonders if it's going to be a good idea to have her dialogue this way, since she was initially introduced as a speaker of the common tongue. Isayama & Araki discuss the scene where Reiner is revealed as the Armored Titan. They want to make sure that the scene will be presented well, but also not via the same method as how they revealed the Female Titan's true identity. Isayama talks aboutt Levi's recent quote, "I hate weaklings, because they die easily." He seems to be dissatisfied with the statement right now, because it's not quite in character for Levi. Since Kodansha didn't fix that line in the tankobon publication, he might discuss modifying the line with Araki when the time arrives to animate that scene. 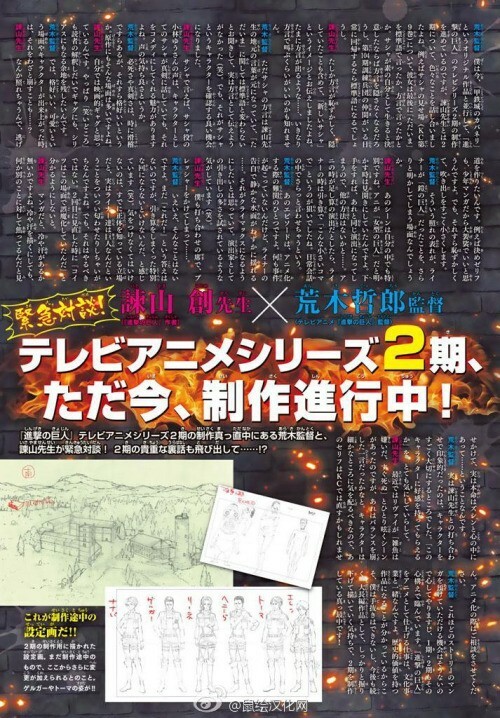 Bessastsu Shonen also provides the initial sketches for the character designs of Mike Zacharius' men Lynne, Nanaba and Gelgar, who will make their debuts in season 2.